Gary Sanchez came oh-so-close to hitting a grand slam in the ninth inning, but Boston hangs on for the series clincher. 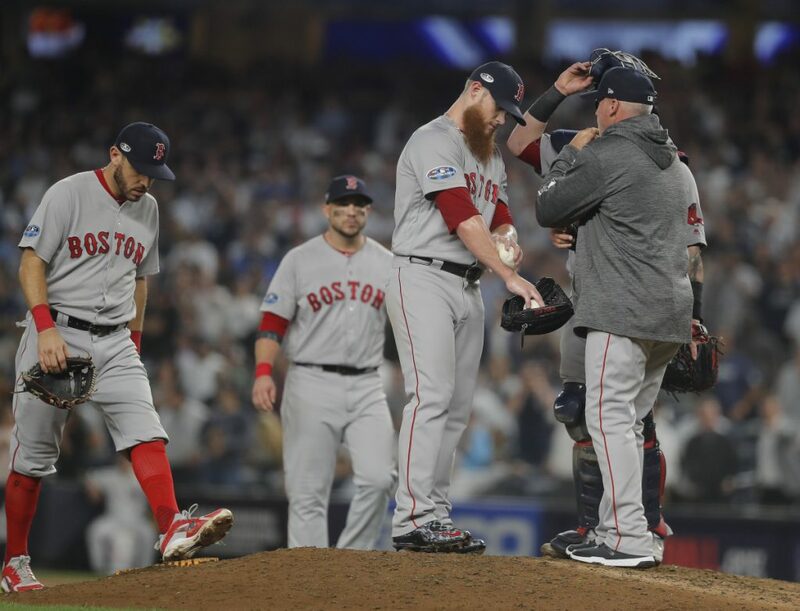 NEW YORK — Boston Red Sox closer Craig Kimbrel might have gotten lucky. New York Yankees catcher Gary Sanchez came very close to hitting a game-ending grand slam in the bottom of the ninth inning Tuesday night. Kimbrel served up a down-the-middle fastball at 98 mph to Sanchez, who demolished it high into the night sky. The ball died at the warning track, and Kimbrel got a groundout from Gleyber Torres to end the 4-3 win, finish the American League Division Series and send the Red Sox into a celebration on their rivals’ home field for the second time in less than three weeks. “The 3-2 to Sanchez was pretty nerve-wracking, but it got to the second out, and we were able to get through it,” Kimbrel said. Wild from the start, he walked Aaron Judge to start the inning, then gave up a single to Didi Gregorius to bring the tying run to the plate in Giancarlo Stanton. But Stanton didn’t have it in this series (4-for-18, no RBI), and Kimbrel got him to chase a slider for strike three. With one out, Kimbrel walked Luke Voit to load the bases, then plunked Neil Walker on the first pitch of the at-bat to bring in one run. The Sanchez at-bat almost ruined his night. The final out was challenged at first base and upheld, delaying the celebration for one minute. Next up, the Houston Astros, who demolished the Cleveland Indians in a three-game sweep. “I don’t know too much about them, just they have a good team,” joked manager Alex Cora, who was the bench coach for the Astros last year. “What they did to the Indians, that was impressive. It seems like they’re playing their best baseball of the season at the right time. They can pitch. They’re playing good defense. They’re swinging the bat well. They’re a complete team. The Astros took 3-of-4 from the Sox in the ALDS last year and now get a chance at a rematch. “It’s about time, it’s about time,” Bogaerts said. “It was tough in this first round for a while, but I think this is a group we have that is pretty special. Game 1 will be Saturday at Fenway Park at 8:09 p.m. ET and Game 2, also at Fenway, will be Sunday at 7:09 p.m. ET. Both games are on TBS. The Patriots play the Chiefs on Sunday Night Football at 8:20 p.m. ET. Home plate umpire Angel Hernandez made headlines after four of his calls at first base were challenged in Game 3, and three of them were overturned. He called the balls and strikes last night, leading to Yankees starter CC Sabathia questioning Hernandez’ ability after the lefty allowed three runs in three innings before getting pulled. Red Sox starter Rick Porcello went five innings, giving up one run. The Red Sox hit .400 with runners in scoring position this series; the Yankees hit .154.